In 2009 I wrote this blog post entitled “The Biggest Problem with Crisis Maps.” The gist of the post: crises are dynamic over time and space but our crisis maps are 2D and static. More than half-a-decade later, Digital Humanitarians have still not escaped from Plato’s Cave. Instead, they continue tracing 2D shadows cast by crisis data projected on their 2D crisis maps. Is there value in breaking free from our 2D data chains? Yes. And the time will soon come when Digital Humanitarians will have to make a 3D run for it. Aerial imagery captured by UAVs (Unmanned Aerial Vehicles) can be used to create very high-resolution 3D point clouds like the one below. It only took a 4-minute UAV flight to capture the imagery for this point cloud. Of course, the processing time to convert the 2D imagery to 3D took longer. But solutions already exist to create 3D point clouds on the fly, and these solutions will only get more sophisticated over time. Stitching 2D aerial imagery into larger “mosaics” is already standard practice in the UAV space. But that’s so 2014. What we need is the ability to stitch together 3D point clouds. In other words, I should be able to mesh my 3D point cloud of a given area with other point clouds that overlap spatially with mine. This would enable us to generate high-resolution 3D point clouds for larger areas. Lets call these accumulated point clouds Cumulus Clouds. We could then create baseline data in the form of Cumulus Clouds. And when a disaster happens, we could create updated Cumulus Clouds for the affected area and compare them with our baseline Cumulus Cloud for changes. In other words, instead of solely generating 2D mapping data for the Missing Maps Project, we could add Cumulus Clouds. Meanwhile, breakthroughs in Virtual Reality will enable Digital Humanitarians to swarm through these Cumulus Clouds. 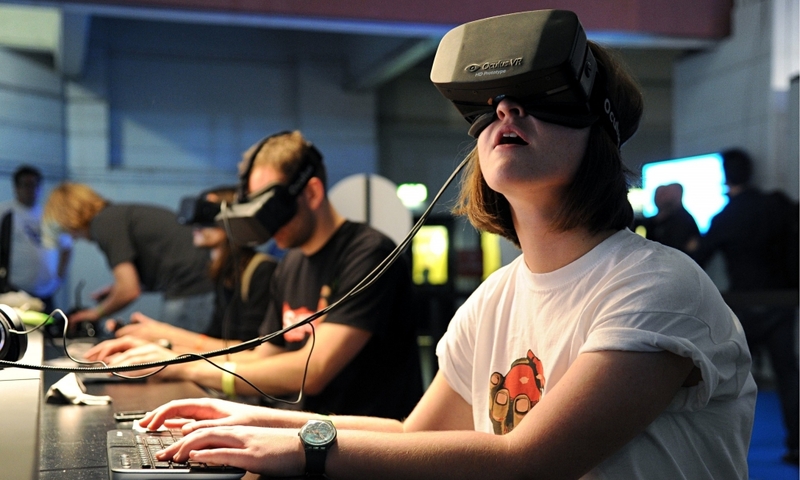 Innovations such as Oculus Rift, the first consumer-targeted virtual reality headsets, may become the pièce de résistance of future Digital Humanitarians. This shift to 3D doesn’t mean that our methods for analyzing 2D crisis maps are obsolete when we leave Plato’s Cave. We simply need to extend our microtasking and crowdsourcing solutions to the 3D space. As such, a 3D “tasking manager” would just assign specific areas of a Cumulus Cloud to individual Digital Jedis. This is no different to how field-based disaster assessment surveys get carried out in the “Solid World” (Real Word). Our Oculus headsets would “simply” need to allow Digital Jedis to “annotate” or “trace various” sections of the Cumulus Clouds just like they already do with 2D maps; otherwise we’ll be nothing more than disaster tourists. The shift to 3D is not without challenges. This shift necessarily increases visual complexity. Indeed, 2D images are a radical (and often welcome) simplification of the Solid World. This simplification comes with a number of advantages like reducing the signal to noise ratio. But 2D imagery, like satellite imagery, “hides” information, which is one reason why imagery-interpretation and analysis is difficult, often requiring expert training. But 3D is more intuitive; 3D is the world we live in. Interpreting signs of damage in 3D may thus be easier than doing so with a lot less information in 2D. Of course, this also depends on the level of detail required for the 3D damage assessments. Regardless, appropriate tutorials will need to be developed to guide the analysis of 3D point clouds and Cumulus Clouds. Wait a minute—shouldn’t existing assessment methodologies used for field-based surveys in the Solid World do the trick? After all, the “Real World” is in 3D last time I checked. Ah, there’s the rub. Some of the existing methodologies developed by the UN and World Bank to assess disaster damage are largely dysfunctional. Take for example the formal definition of “partial damage” used by the Bank to carry out their post-disaster damage and needs assessments: “the classification used is to say that if a building is 40% damaged, it needs to be repaired. In my view this is too vague a description and not much help. When we say 40%, is it the volume of the building we are talking about or the structural components?” The question is posed by a World Bank colleague with 15+ years of experience. Since high-resolution 3D data enables more of us to more easily see more details, our assessment methodologies will necessarily need to become more detailed both for manual and automated analysis solutions. This does add more complexity but such is the price if we actually want reliable damage assessments regardless. Isn’t it ironic that our shift to Virtual Reality may ultimately improve the methodologies (and thus data quality) of field-based surveys carried out in the Solid World? In any event, I can already “hear” the usual critics complaining; the usual theatrics of cave-bound humanitarians who eagerly dismiss any technology that appears after the radio (and maybe SMS). Such is life. Moving along. I’m exploring practical ways to annotate 3D point clouds here but if anyone has additional ideas, do please get in touch. I’m also looking for any solutions out there (imperfect ones are fine too) that can can help us build Cumulus Clouds—i.e., stitch overlapping 3D point clouds. Lastly, I’d love to know what it would take to annotate Cumulus Clouds via Virtual Reality. Thanks! Acknowledgements: Thanks to colleagues from OpenAerialMap, Cadasta and MapBox for helping me think through some of the ideas above. This entry was posted in Crisis Mapping, Drones/UAVs, Humanitarian Technologies and tagged 3D, PointClouds, VirtualReality. Bookmark the permalink. Interesting. I may be one of those cave-bound Humanitarians you describe. Always thought of myself rather not cave-bound and have adopted some technology that was invented after the Radio (I suppose you refer to HF/VHF Radio and not 4G) like 3D printing and indeed UAVs, but I fail to realise what this 3D mapping is going to add to the baseline of helping people on the spot. While you make the maps, who is going to provide assistance to them? what is going to be the actual use of those 3d Maps? How will you actually share them with people without access to the technology to see them, like the population you seek to provide assistance to? I just see much better uses for the money, but by all means do prove me wrong because I do like how it looks like. Thanks for reading and commenting, Eto. What the 3D mapping analysis does is facilitate disaster damage assessments and make them more accurate (as mentioned in the blog post). The results of the 3D analysis can be shared in whatever format (paper, poster, sms, etc) you want. Seeing your reference to methodology and ontology in the latest blog, Patrick, made me read this post too. You are critical of the UN/WB “developed” methodology for assessing damage on imagery, for initial assessments and PDNA as well. I agree that much can be improved. And the International Working Group on Satellite-based Emergency Mapping (IWG-SEM) is trying to address just that, by recently setting up a subgroup to agree on damage tagging “standards” for wider adoption, standards that could then be implemented on crowd-sourcing platforms as well. HOT-OSM is already supporting the effort. I invite you and anyone else who wants to improve things on these to actively participate in the IWG and its damage-tagging subgroup.